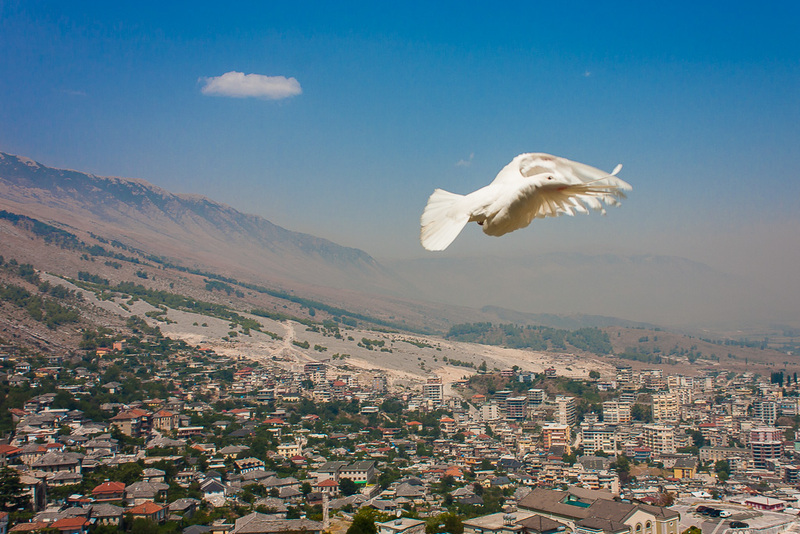 Albania – a beauty with a damaged reputation 2/2. We longed for salty water, sandy beach and splashing waves. We looked into our paperback travel guide. It navigated us to Velipoje and promised to find it all there. Well, we got a bit disappointed. In Velipoje only crowds of tourists waited for us. The beach there was covered with obligatory rentable sunshades and deckchairs. Access to the beach was charged as well. Loud music messed up the whole place. 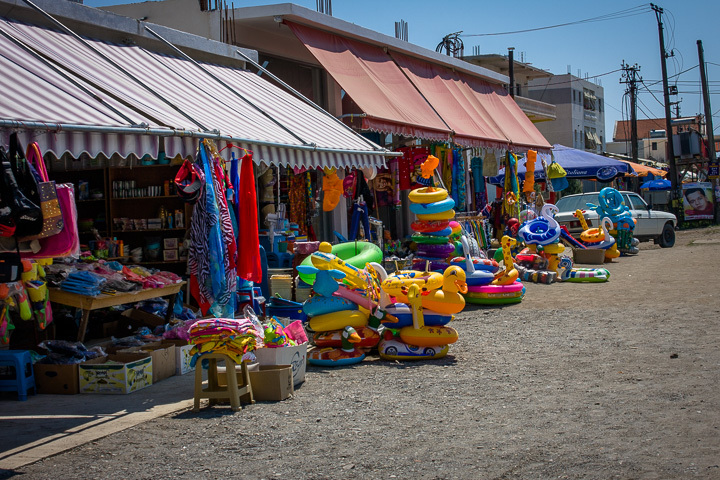 Shops and stalls with beach accessories were located on dirty and untidy streets that were covered with litter. The traps of cheap commercialism and kitsch ambushed us. In order to measure the length of our stay in Velipoje minutes are enough. We drove along the coast further to the south. We do not know why but we again trusted our travel guide. 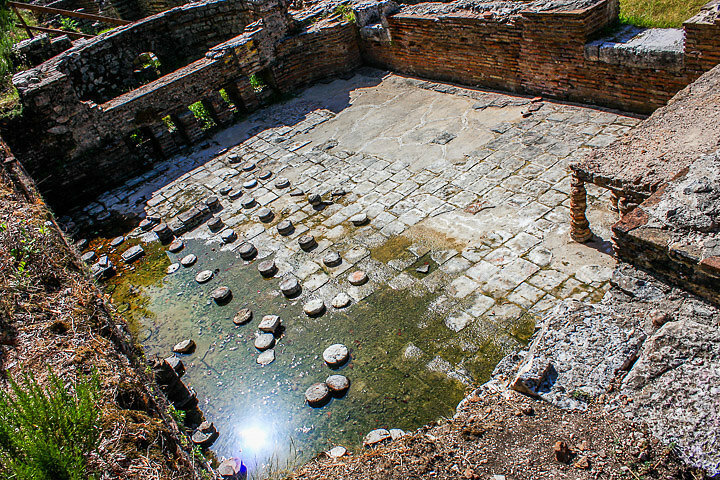 It promised Roman bath and the biggest well-preserved colosseum on the Balkan peninsula in Düres. Instead of Roman spa we found just a ruin with a couple of ancient columns that were surrounded by a rusted fence. Instead of colosseum we found only its torso. 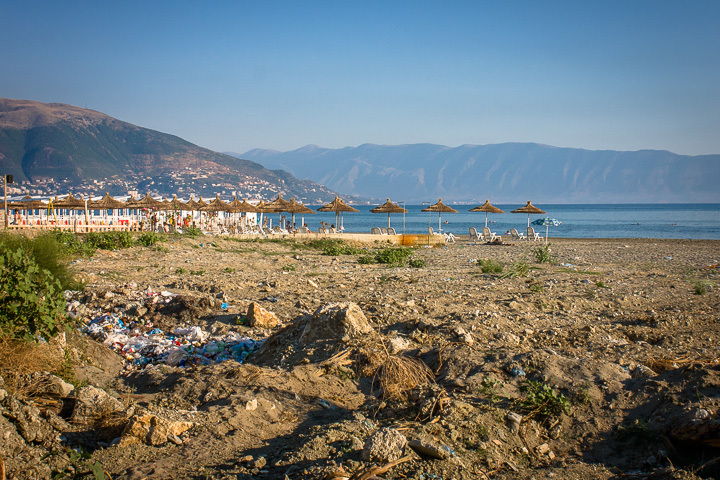 Neither in Vlore, another short stop on our journey, did not our dream of beautiful beach come true. The beaches there were quite dirty, although it was not visible on the first sight. The reason was dump sites that just a short time ago these beaches used to be. As soon as the local people recognized the potential of beaches in terms of tourism they sent excavators which buried all the waste underneath the sand. In order to ensure the new image of their beaches, they placed romantic gazebos there. As we proceeded further to the south the situation had dramatically changed. Along the road we observed brand new vacation resorts. The shingle beaches were clean and tidy, the sea was calm and crystal clear. On the other hand, we noticed that what the local business men understand as tourism development is exclusively building new hotels. They somehow did not pay attention to the fact that the tiny beaches cannot absorb the capacity of the nearby hotels or that the streets between the hotels are not paved at all. The next leg of our journey crossed the national park of Llogara. After long ascending a beautiful view of open sea opened to us. We stopped at a vantage point 1037 meters above the sea level and enjoyed the view of green pine trees above us, the azure tones of the sea beneath us and the whiteness of the adjoining beaches. From this point we could even see Corfu and it looked so closely. What was however the most important thing – finally we found the beach we were looking for all the time! We descended from the top of the hill along the narrow and crooked road. We could not wait to get to the beach. We found a camping site in Dhërmiu, left our stuff there and finally set off to the beach. Smooth, white and round pebbles, crystal clear sea water of all shades of blue and turquoise. Ideal conditions for snorkeling, some people only here and there – this was exactly what we were looking for. As we walked along the beach we noticed that the overall age average is quite low. We noticed it but did not investigate on it further. We however found out as soon as the sun went down what that meant. With the last rays of sun, a wild techno party started on the beach. It was so loud that it could be heard miles away. Tedious music finally ceased at 7 o’clock in the morning, a long time after the sunrise. Fortunately, the program of our previous day exhausted us to such extent that we were able to sleep deeply even in the middle of that techno hell. Why was that? After the first snorkeling session, our instincts of explorers showed again. We wanted to find exactly that one beach we could observe from the vantage point. In comparison to the one we were at, the other beach had one irretrievable advantage – it was deserted. We quickly found out why that was. There were only two ways how to get to that beach. One of them was by car. It however had to be an off-road with tires in perfect condition. Since we did not qualify for this one we had to use the other way. To walk. We felt like we were the Czech tourists in High Tatras. On our way to the other beach we had to overcome a cliff. We however were dressed like someone going to the beach. We made it anyway. Thanks God! It was definitely worth it. For the rest of the day we were granted an exclusively private beach. In the evening, our paperback travel guide even informed us that exactly on this one Mr. Julius Caesar disembarked with seven legions in 49 B.C. in order to fight with Mr. Pompeius. 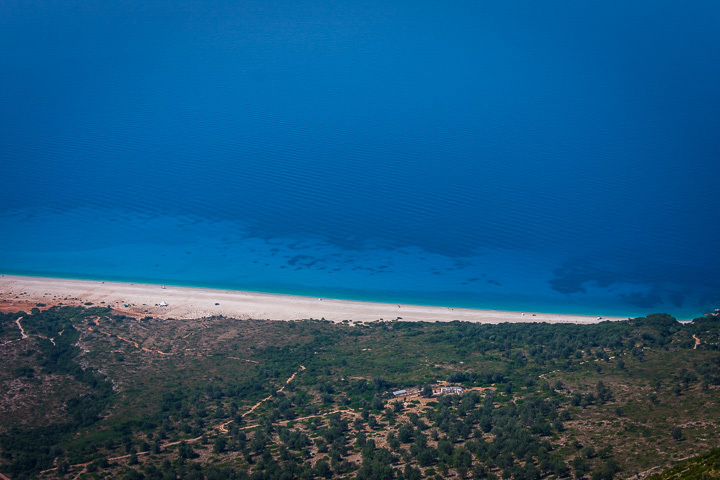 Our voyage around the Albanian beaches found its end in Ksamili. It is very close to the border with Greece and Corfu seems to be so close that you believe you could reach it by swimming in the sea. The environment in Ksamili was far more cultivated. We enjoyed romantic walks on the promenade along the seashore. The beaches here were however small and shingle. We liked our stay in Ksamili especially thanks to our camping site. 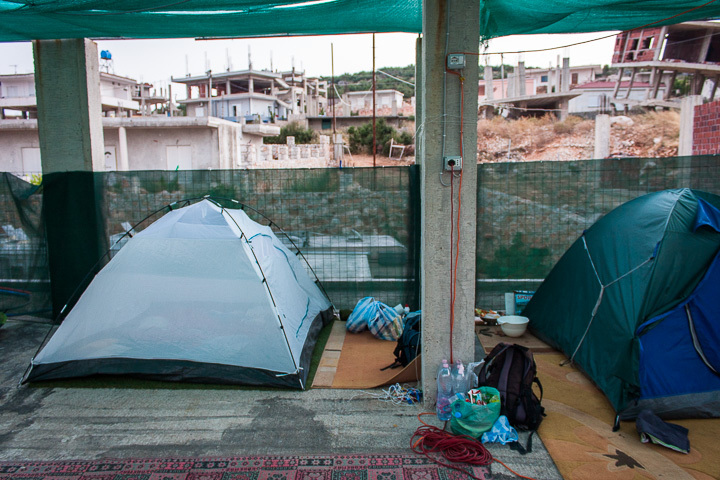 While in Koman we raised our tents de facto underneath the bridge, in this camping site we moved with our tents to the roof of a house. Well, in fact it was not a roof. It was just another floor of the house – just not finished yet. 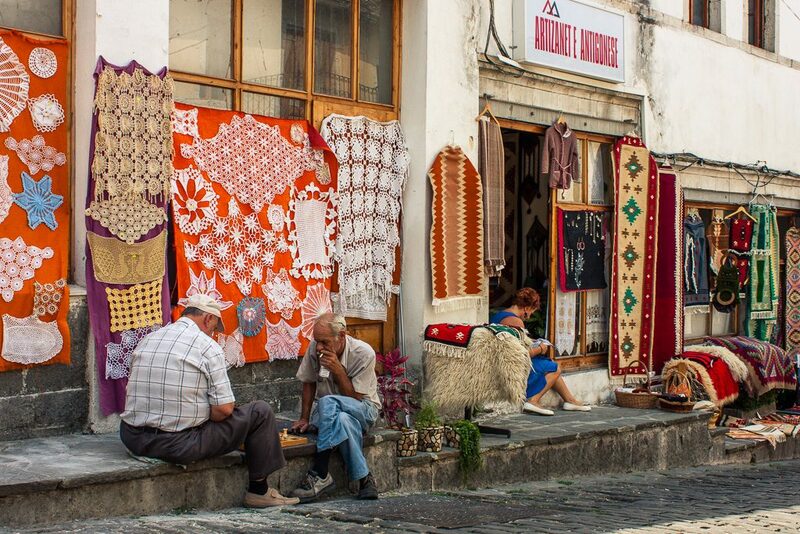 Many Albanians do not finish their houses for years. The reason is quite simple. For such houses they do not have to pay taxes. And so, they built their houses in stages. First, the first floor. Then you have to wait a little until you save enough money to build the next floor. In a result, panorama of many towns is often marked with metal poles sticking up to the sky. And since the rain is very rare here, nobody is concerned with leaks. 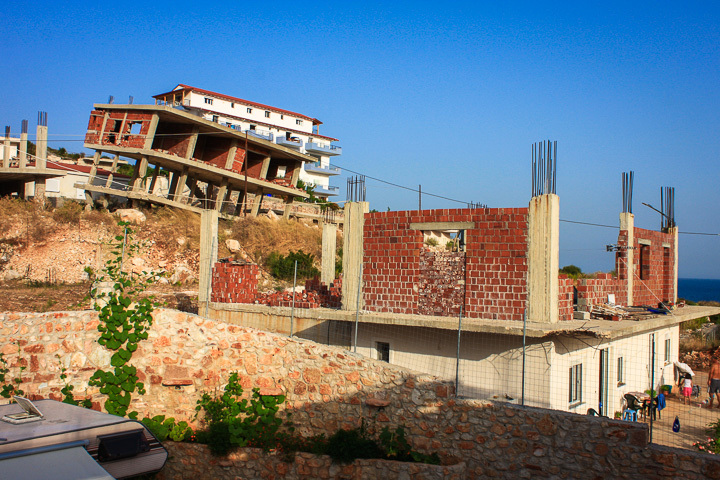 Another interesting observation we made in Albania was the way how the authorities deal with illegal constructions. If anybody starts to build a house without the respective permission, they (seem to) wait until the construction is almost finished and then send an excavator. The machine is able to cause such damages to the structural stability that it cannot be finished anymore. The result? Very often you can observe unfinished, damaged and abandoned houses. It reminded us of some post war country or a city damaged by an earthquake. Anyway, let’s get back to our camping site. It was located almost on the top of a hill above a small bay. It provided with a beautiful view of the bay as well as of the sea. The hosts were living in the house and the campers around the house. Spots for tents were located on the unfinished top floor of the house. It was covered with a camouflage fabric that created a very nice shadow the whole day. On the top floor we were also provided with a fridge. And the best thing about this place was Wi-Fi. This was the first camping site on our journey around Albania back in 2012 in which we found Wi-Fi. Owner of the camping site – a very nice and friendly Math teacher – had lived abroad for a couple of years. It is very probable, that he had brought the know-how “what makes a guest happy” from abroad as well. After our arrival he and his wife welcomed us with an ice coffee. He surprised us with his knowledge of our country. When we said Slovakia, he immediately reacted “Dubček”. It was also very interesting to discuss with him about his country – Albania. While in Dhërmiu we were tortured by techno, in Ksamili we faced some kind of disco version of the traditional Arabic music. Across the bay there was a disco club in which every night a disco or a concert took place. We could not even rely on the electricity outages that appeared so often in Albania back in 2012 because of the heat and droughts. The disco club was equipped with its own generators. And so, only the lights of the disco club illuminated the dark night and the tones of music carried to the distance. Although we were already resistant enough to sleep well in this environment, our German neighbors were not that lucky. As they told us on the following day, they were not able to sleep until half past two in the night. On our way back from the south of the country we chose the route leading us through inland. 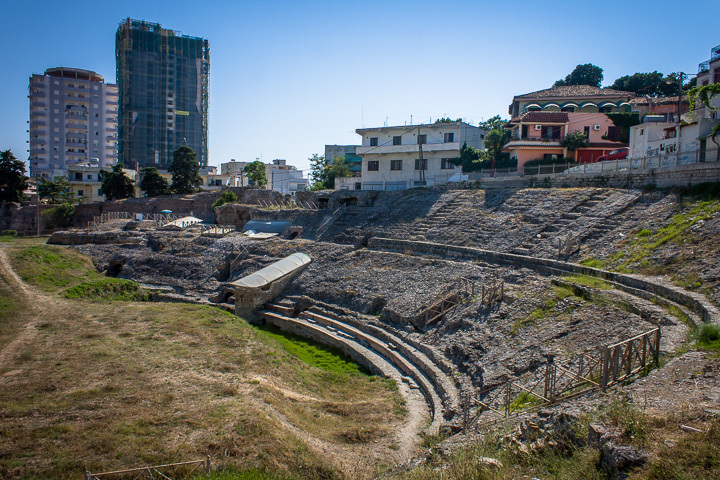 Our first stop was Butrinti, the most interesting place we visited in Albania. 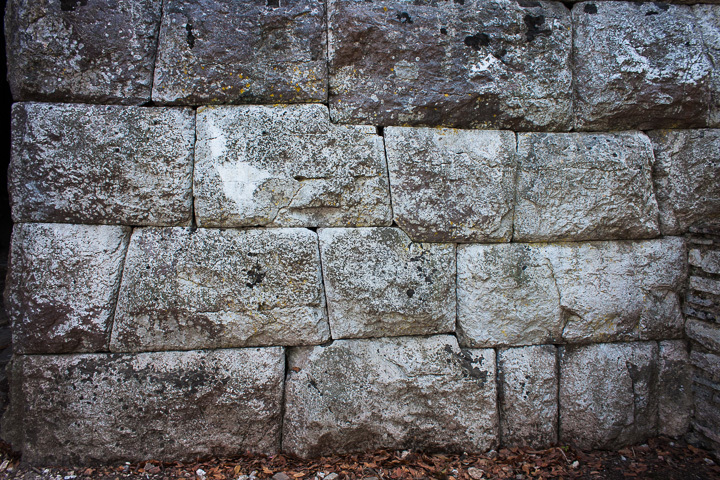 While we were quite disappointed of the ancient sights in Düres, we got absolutely delighted by those in Butrinti. On this small piece of land surrounded by water numerous very well-preserved relics can be found. They come from all periods of history – the ancient Greece, the ancient Rome, the Byzantine Empire etc. Due to the strategic location of this small peninsula it became very often a target of many battles. But it was also marked by natural disasters. Therefore, we found it even more astonishing that all those sights remained almost untouched until our times – the ancient Greek and the ancient Roman theatre, the ancient Roman bath, the mosaics decorating the Byzantine baptistery floor or the fortification constructed by the ingenious old masters who were able to build an unconquerable fortress just by shaping the stones in the right way. We continued to Gjirokastër and made a stop by the Blue eye lagoon. It is a unique natural formation. The source of cold water is located very deep. The water first cumulates in a small round shaped basin and then flows away in a small creek. 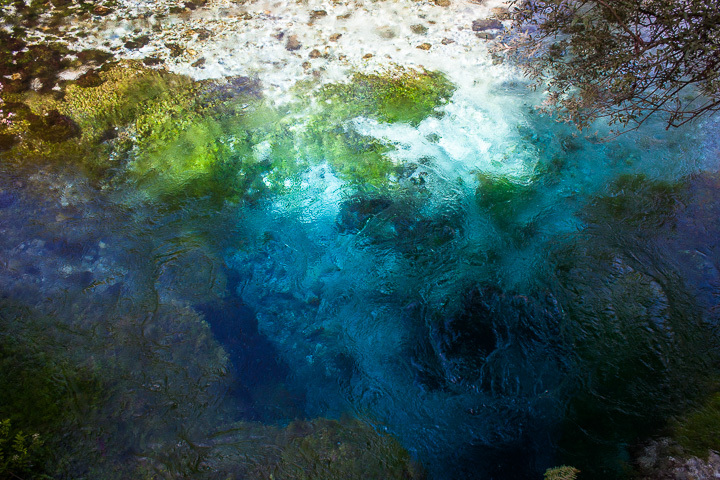 In the center of the basin the water is of dark blue color, on the peripheries it turns turquoise. If you look on the basin from above, you understand where the name comes from. 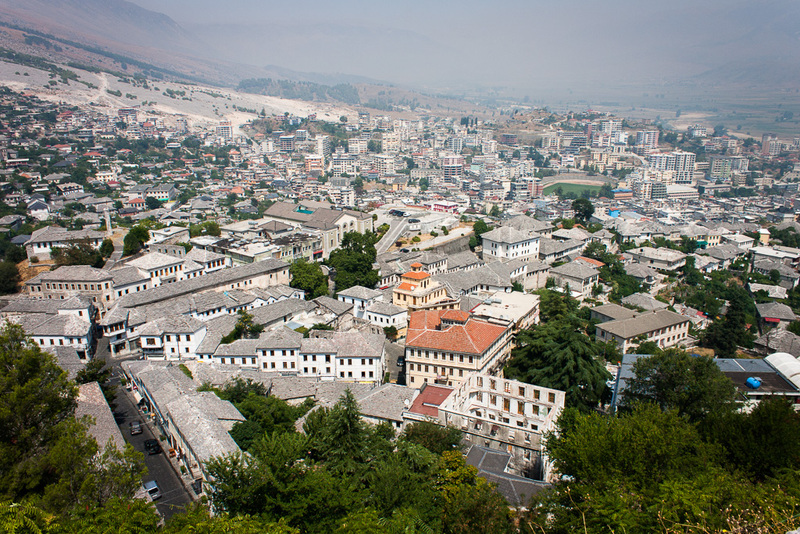 Our last stop in Albania was Gjirokastër. Its architecture is listed on the list of the UNESCO World Heritage. What we definitely do not recommend is to enjoy the beauty of this site at noon since the temperature can rise as high as 40 °C. Anyway, Gjirokastër is definitely worth visiting. In the city center interesting shops and people can be found. What we appreciated most was that these were not the typical shops for tourists but real shops offering some traditional stuff. Above the city the fortress of Ali Pasha of Ioannina is rising. Actually, what is left from it. Part of the exposition you can find inside are several cannons from the WW II and a wreck of an American airplane that was forced to an emergency landing here in the 50’s. Apart from attracting the tourists this fortress plays another important role. Once in 4 years it becomes the venue of traditional and folk-art festival. For this occasion, numerous folk groups and ensembles from the whole country as well as from abroad arrive here. Many of them include in their performance another item listed on the UNESCO World Heritage list – the Albanian iso-polyphonic folk music. And this is where the story of our Albanian trip ends. We returned back home through Montenegro where we also saw many interesting places. That is another story though. 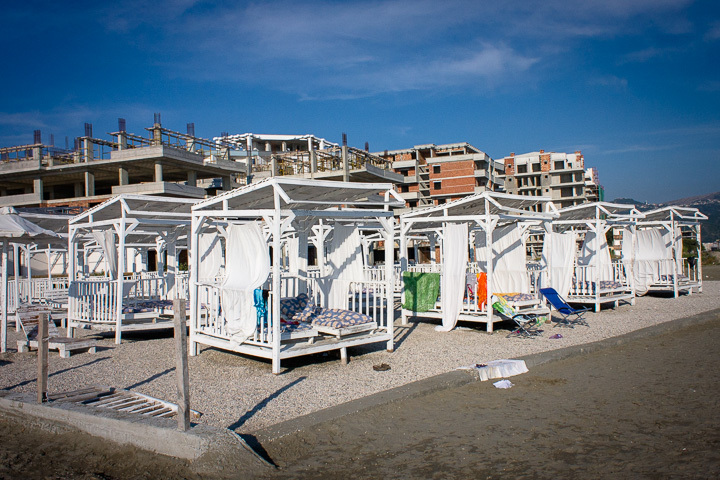 More photos from Albania on www.tomaskozik.com.